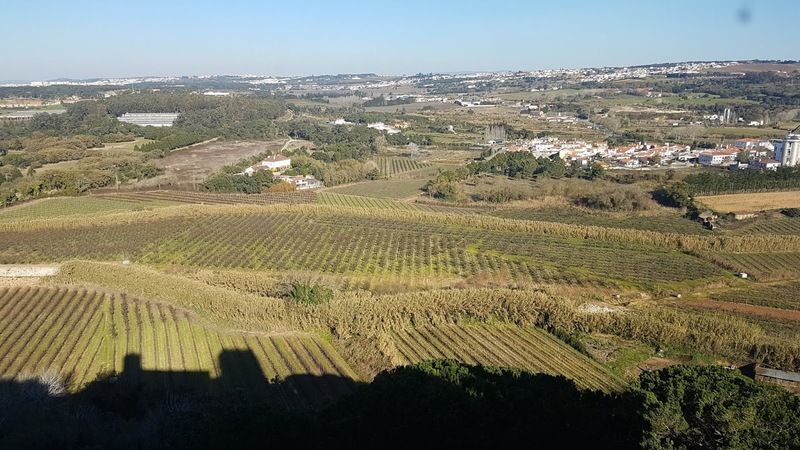 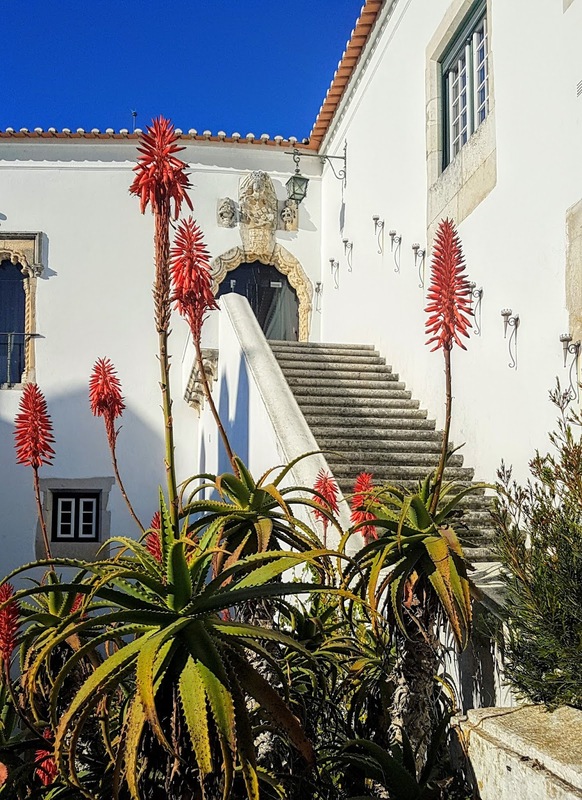 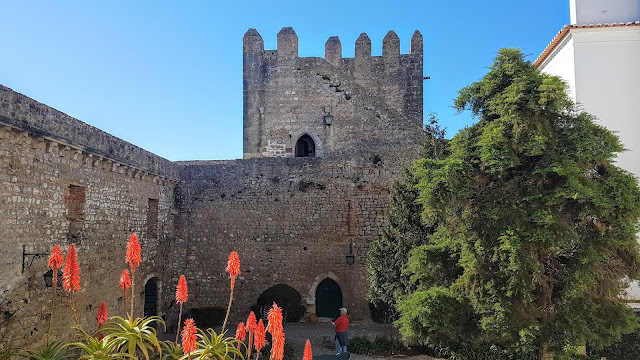 On a hill in southern Portugal not far from Lisbon sits a medieval town surrounded by an imposing stone wall with an ancient castle at one end. 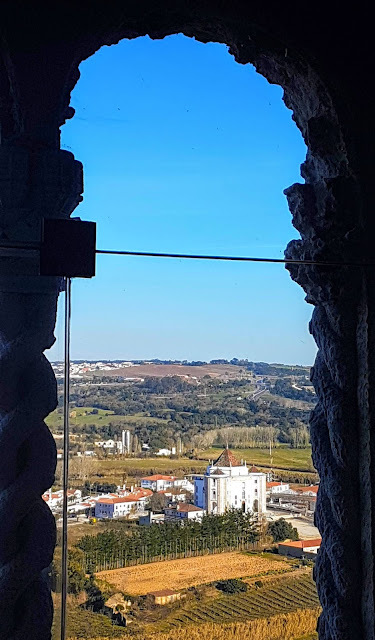 That town is Obidos, the castle is called Castelo de Obidos, and part of that castle has been turned into an inn and restaurant called, appropriately enough, Pousada do Castelo or "Inn of the Castle". 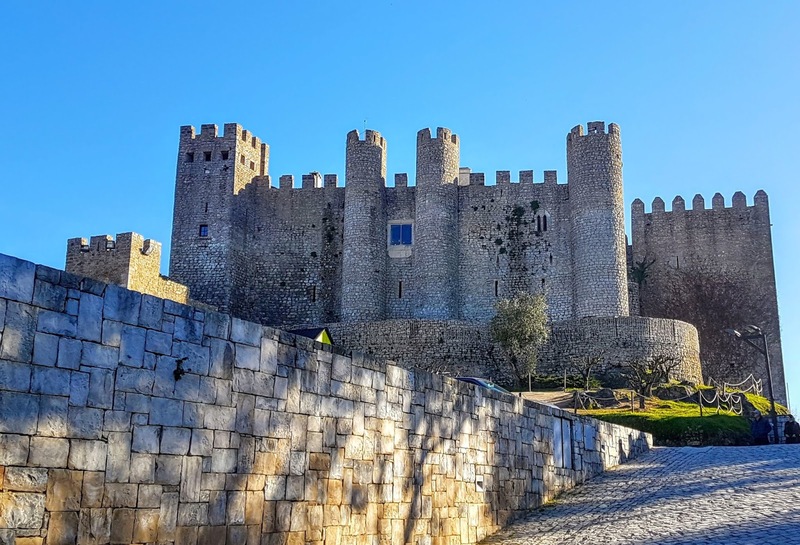 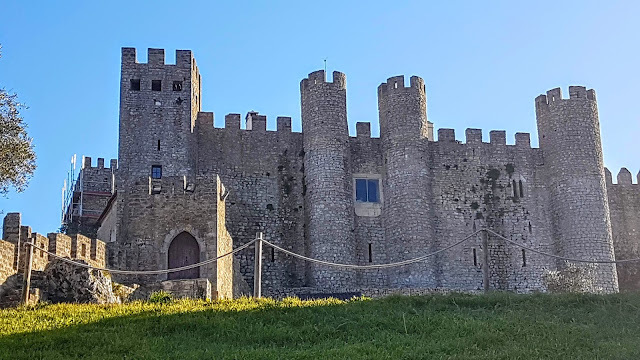 The castle is one of the "Seven Wonders of Portugal" and it said that Obidos is so beautiful that the King of Portugal has symbolically given Obidos to his wife on their wedding day as a testament to his love. 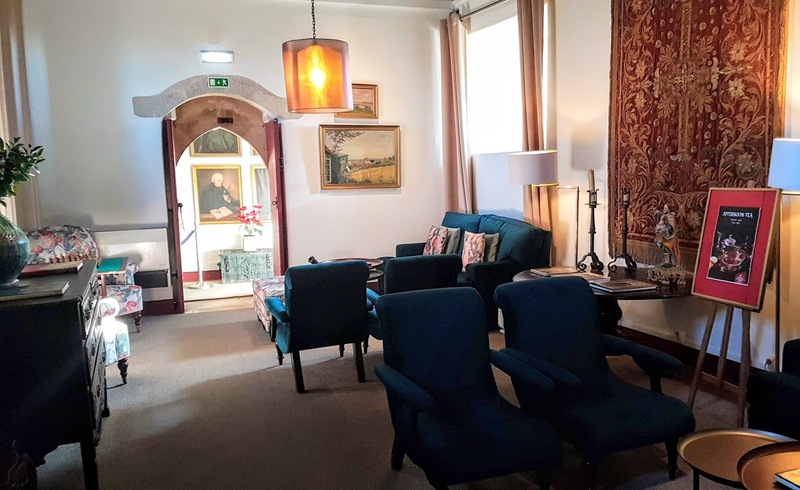 Pousada do Castelo was named Portugal's "Inn of the Year" in 2017. 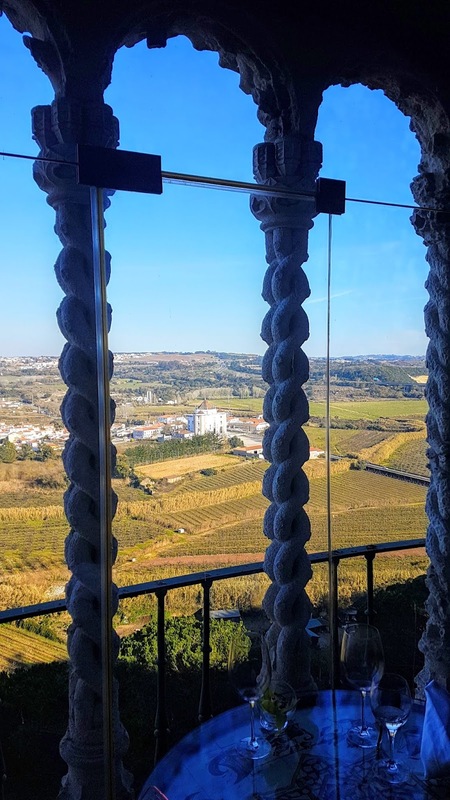 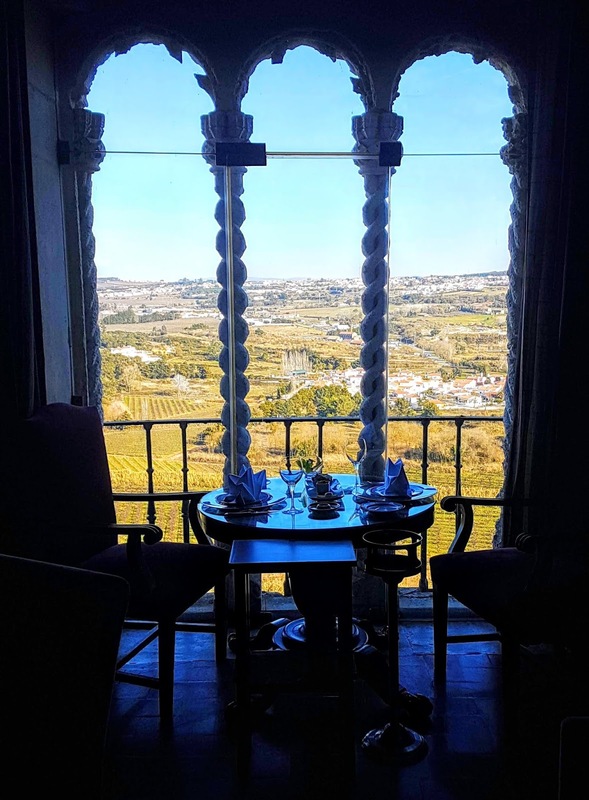 Our table sat in a niche in front of an ornate arched stone window overlooking the sprawling valley, lush vineyards, and neighboring small village. 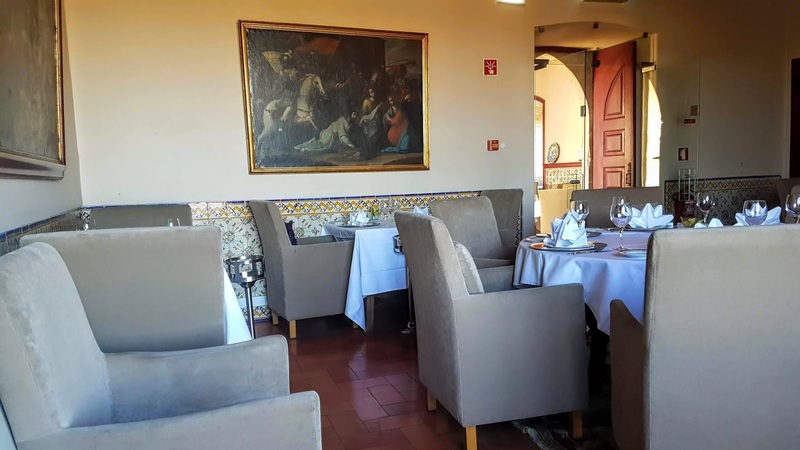 Our server, Jorge, could not have been nicer nor more professional. 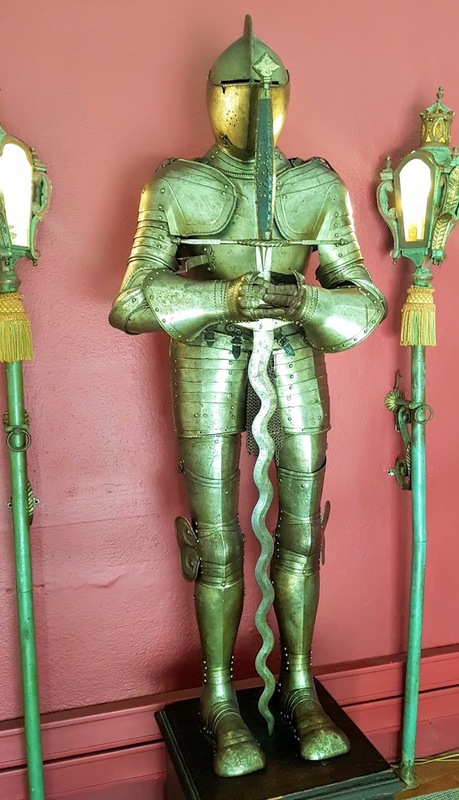 We found out later that he had left his ill mother at a local hospital in order to work his shift. The restaurant is simple yet luxurious with historic works of art and ancient tapestries adorning the walls and plush, comfortable chairs at each table. 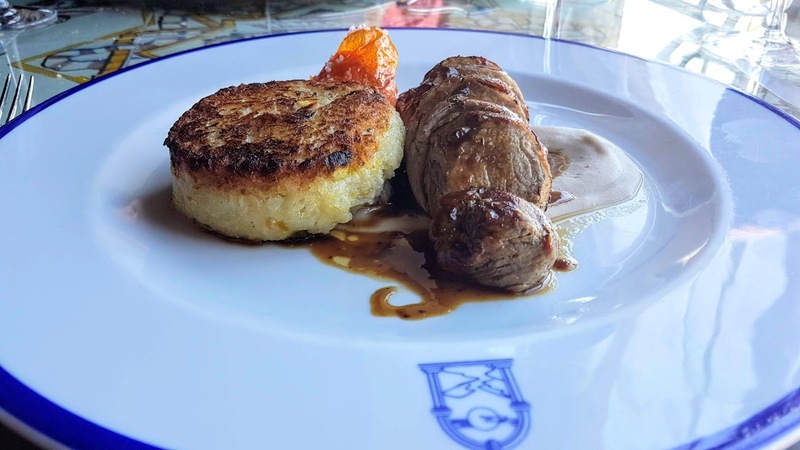 The inn's monogram adorns each plate. 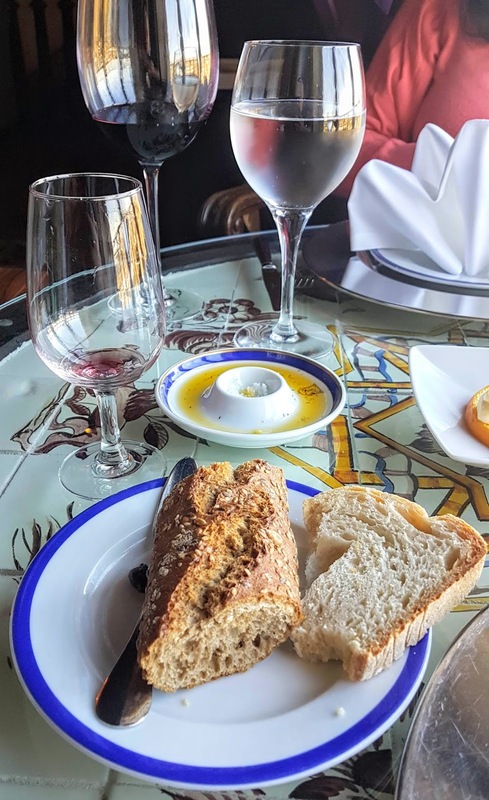 Jorge immediately brought out the standard Portuguese "couvert" ("cover" - €4/each), which was anything but standard in this case, including fresh breads and butter, local olives, and an EVO dip along with a bit of sea salt. 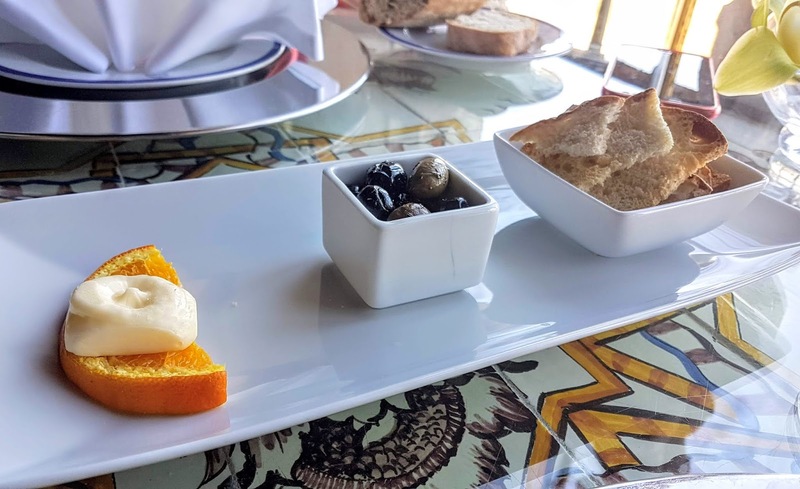 The brown bread was absolutely delicious, crunchy outside with an array of toasted seeds and soft and warm inside. 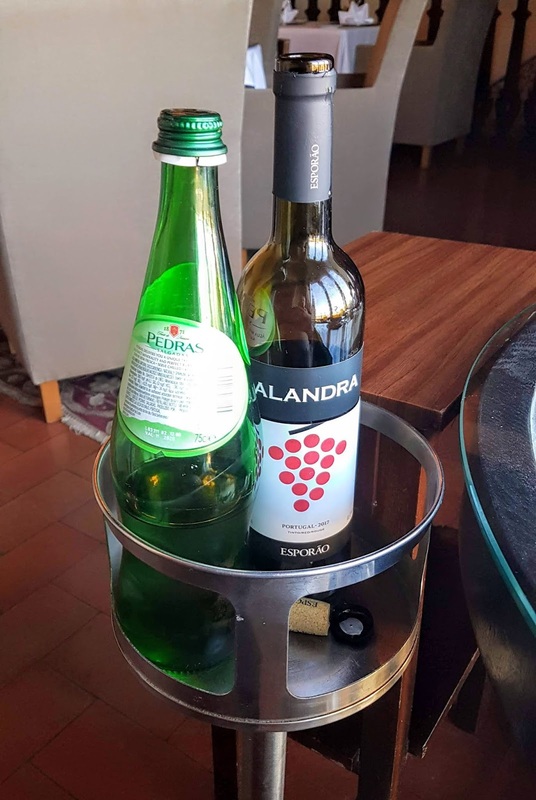 We also ordered a bottle of a robust Portuguese "Alandra" red wine (€16) and a liter of sparkling water (€3.50). 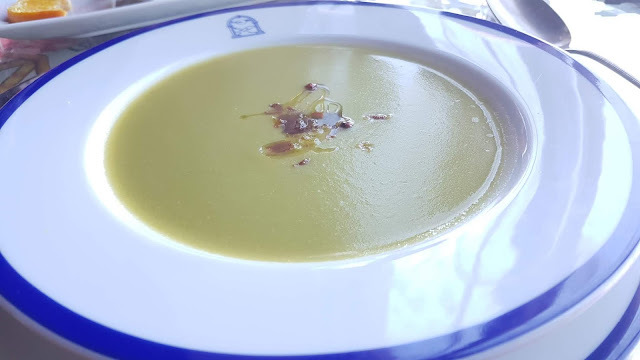 I started with the Creme de Ervilhas (€6), a bowl of rich and creamy pea soup topped with a bit of crispy smoked ham that was perfectly seasoned. 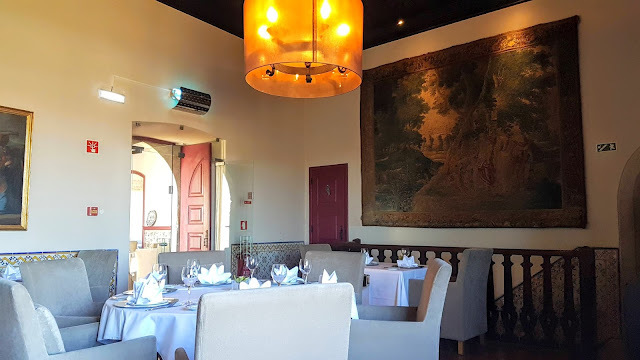 For my main course, I ordered the Lombinho de Porco (€23), a perfectly cooked, small pork tenderloin sliced into six thick medallions, sitting atop a creamy, savory chestnut sauce and pork reduction. 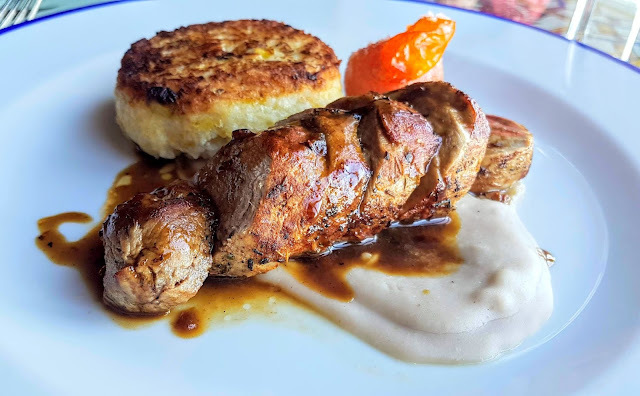 The tenderloin was accompanied by a disc of asparagus risotto that was crunchy outside but still a little creamy on the inside. 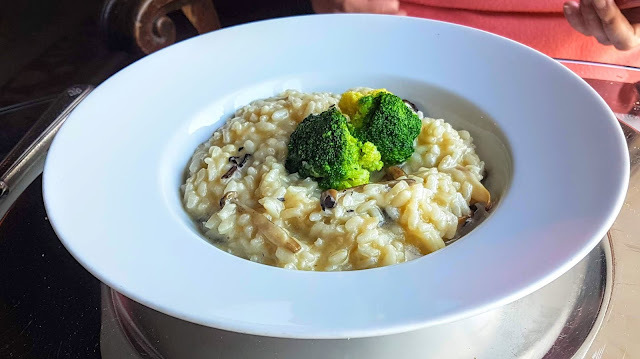 My wife decided on the Risotto de Cogumelos (€16), a simple yet delicious mushroom risotto with steamed broccoli that was perfectly prepared, not too thick and not too runny. The serving size was just right. 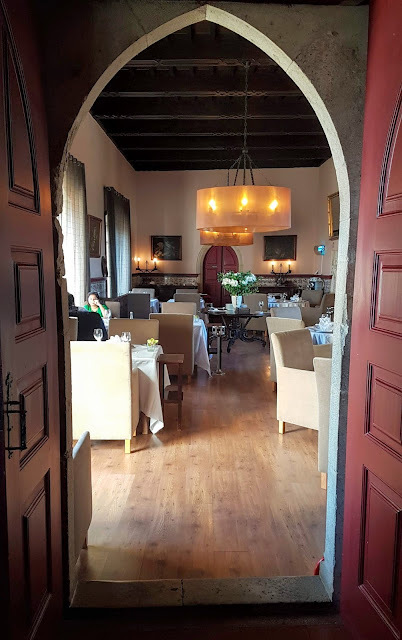 Preferring sweets to soup, she followed the risotto with the Brisas do Lis (€8.50), a decadent 15th Century dessert made with eggs, sugar and almonds, similar to flan, and accompanied by a scoop of strawberry ice cream. Our meal was wonderful, made even better by our extraordinary and historic surroundings, an absolutely amazing view, and service that was friendly and attentive without being either overbearing or evasive. 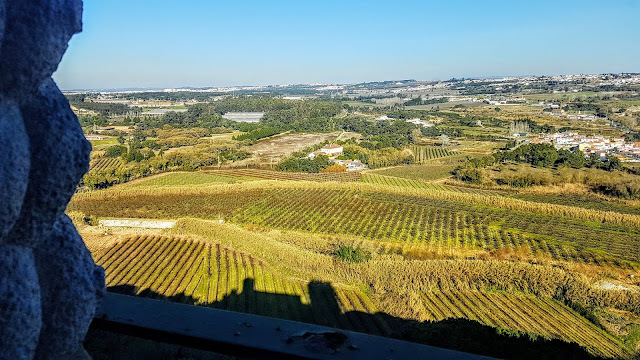 It was the best €93 (including tip) I have spent in recent memory, evoking this comment from my wife: "that was the best meal we have had in our three weeks in Portugal". 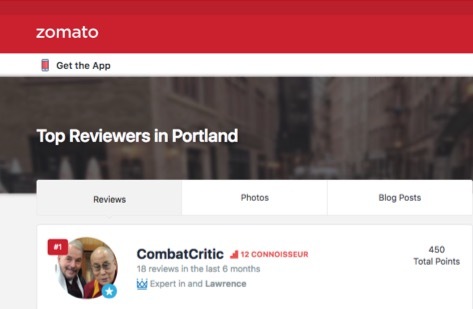 CombatCritic Gives Pousada Do Castelo 9 Bombs Out Of 10 ... More Bombs Are Better!